This space wallpaper is an artist’s impression showing the magnetar in the very rich and young star cluster Westerlund 1. This remarkable cluster contains hundreds of very massive stars, some shining with a brilliance of almost one million suns. 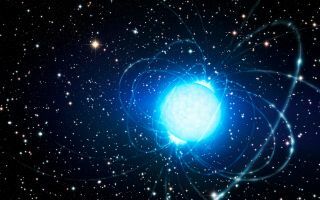 European astronomers have for the first time demonstrated that this magnetar — an unusual type of neutron star with an extremely strong magnetic field — probably was formed as part of a binary star system.